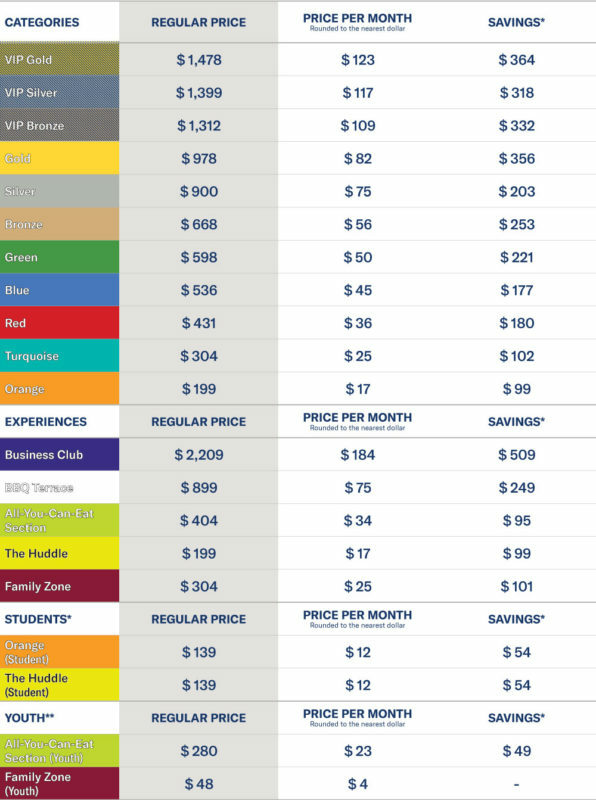 *Savings calculated in regards to regular season individual ticket prices. For a maximum of three games, you can choose to return your tickets. In exchange, get seat upgrades or additional tickets for the games that best fits your schedule. Use your member card as a method of payment at concession stands and for the first time at stadium stores also by linking your credit card! We are saving your spot for all 11 games*, 9 regular-season games, one preseason game and one playoff game. You have the best possible price and can reserve suites, groups and events before everyone! A dedicated Account Manager is there for you every day of the work week. You can also access your online Account Manager whenever you want to transfer, print or resell your tickets. Q&A sessions, Members’ Day, meet and greets on the field after the game… We always make sure to invite you to special events. We just love to see you so much! Would you prefer to pay your membership in installments? No problem! Our flexible payment plans allow you to pay over 6 or 12 months. Contact us to learn more. It pays off to share your passion for the Alouettes! Get rewarded for referring new fans. Take advantage of additional benefits based upon your seniority (consecutive years). Your loyalty and support are priceless and, for that, you deserve to be showered with gifts. Some of you have been with us for over 21 years! Helmets off to you! We added a new benefit to the mix just for you! After their first renewal, Season Ticket Members can benefit from the Early Bird pricing for a limited time only. An exclusive gift will be delivered to all season ticket members! $250 credit redeemable for regular season tickets ($250 per account). Valid in 2019 only for: individual game tickets, group tickets and suites (some restrictions apply on certain Prestige products). The credit cannot be combined with any other offer, not redeemable for cash, non-refund or promotion and cannot be used for the 2020 renewal. *A credit of $100 is attributed to season memberships in the ORANGE, All-You-Can-Eat and the Huddle section. To participate in these activities, you must contact your Account Manager. Spaces are limited and allocated on a first come first served basis. You can only take part in one activity per season. Given the high demand for these activities, the dates will be selected by the Montreal Alouettes organization. Members must show their chip card to take advantage of the discount. The discount doesn’t apply to alcoholic beverages and cannot be combined with any other offer. An additional 5% will even apply on already reduced prices at the store! Invitation to a private event where members can meet Alouettes ambassadors, cheerleaders and other special guests. A perfect opportunity to talk football with other passionate fans! Members must confirm their presence and print their tickets prior to the event (the dates will be determined by the Alouettes and shared with members before the start of the 2019 season). The name associated to your account presented on the Hall of Fame wall in the stadium. If you choose not to renew your membership, you will no longer be eligible to the recognition program. Become a member of our brand new “Forever an Alouette” program and take advantage of a 12-month payment plan with no interests or service fees. Toujours Game in 2019 ! Once again, the team is innovating to offer products tailor-made for all generations of fans. Discover the new features that you will be dying to try next season! No need to keep looking for family-friendly activities! There is something for everyone – parents, teens and little ones – in our new Family Zone. Your kids are always on the move? No worries! We will keep them busy. Your favourites are back and better than ever. You’re probably thinking ''This section isn’t new''. Actually, we listened to your concerns and decided to tweak our offering based on your preferences. Traditional stadium food is what you want. Traditional stadium food is what you get. Back to basics. Football and BBQ go hand in hand. That’s why we’re bringing back the BBQ Terrace in 2019! Same all-inclusive deal, same decadent menu, more space! Classier, more exclusive than ever and absolutely perfect for nights out with your clients, partners or employees. Plus, our new all-inclusive formula is 100% worry free! Even the alcoholic beverages are included! In 2019, we are also offering you the opportunity to hold your annual team building activity or offsite event at the stadium.